The IAF hit two vehicles carrying weapons in Gaza City, setting off secondary blasts. The IAF hits a weapons convoy in Gaza City on Tuesday afternoon. Two vehicles were targeted. 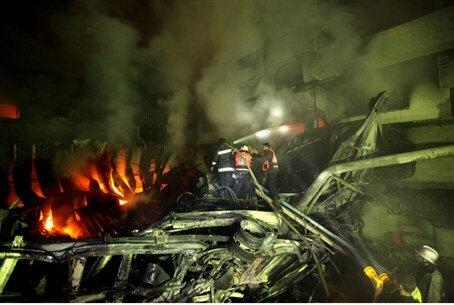 The strikes set off secondary blasts as the explosives in the vehicles caught fire. Gaza media reported six people were killed in the attack. Three of those killed were identified as Subhi, Salah and Ahmad Dughmush. Hamas continued targeting Israeli civilians Tuesday with strikes in Ashdod and the Eshkol region following a strike earlier in Jerusalem. At least seven people were wounded. The IDF has warned residents of northern Gaza to evacuate to Gaza City center.